The city of Ternate in eastern Indonesia seems forgotten by time. Its quiet bustle is confined to the coastal fringes of Mount Gamalama, with its imperious presence. The most prominent building in the low-slung city is a monumental new mosque, minus two of its four minarets that fell down in a recent earthquake. The seat of provincial government has been moved onto the larger nearby island of Halmahera. The stone skeletons of four substantial forts, however, bear witness to a turbulent past. Ternate was the legendary spice cornucopia that Portuguese sailors set out to find. Here grew fragrant cloves, and the Sultan also exercised sovereignty over the Banda Islands to the south, the world's sole source of nutmeg. For centuries Arab traders had brought these spices to the Middle East, with Venetian middle-men taking them onwards to Europe, at huge mark-up. When the Portuguese discovered the trade route via the Cape of Good Hope, the way was open for them to collect their own spices direct from the Sultan of Ternate, who became their treaty ally. They went on to establish their trading entrepôt at Malacca early in the 16th century to oversee the spice trade: 'whoever is Lord of Malacca has his hand on the throat of Venice'. Here, surely, was a very early, fully operational manifestation of international integration, the embryonic form of today's ubiquitous globalisation. We would recognise its constituent elements. Here was the tenuous but well-structured supply-chain, extended all the way from Banda to Amsterdam, via numerous ports and functionaries, administered with brutal efficiency by the Dutch East India Company, perhaps the first business organisation that bears resemblance to today's multinational corporations. The company raised money by issuing shares. It had the first widely-recognised commercial logo. Even without today's computers, the company's officials were linked through a hierarchy of regular detailed reporting and accounting. Production was brought together in plantations and processed in 'factories'. Near-subsistence agriculture was replaced with scale and quality control, supervised by the perkeniers with an incentivising profit-sharing deal with the company. Customer feedback was insistently relayed to producers: 'small nutmegs are of no value'. One key characteristic of the Dutch trade might serve as a reminder that globalisation is not always exactly the same as the 'free market' expounded in economic textbooks and extolled by business. The central organising principle of this Dutch trade was that it would be a monopoly. The Dutch East India Company had a royal charter – a government-endorsed monopoly. Today we would call it a 'national champion', taking on the world on behalf of Holland. It fixed spice prices and manipulated supply. This monopoly not only involved fighting the opposing colonial powers tooth and nail and reaching territorial deals such as the 1667 Treaty of Breda that swapped Manhattan for Run, a tiny British possession in the nutmeg-rich Banda islands. It also involved the elimination of native populations that had not joined the Dutch supply chain. Sometimes this was by mass execution, bordering on genocide. At other times the natives fled to safer islands beyond reach of the Dutch (and beyond spice-growing territory). Whatever the means, the outcome was the same: a strict Dutch monopoly. As has remained true of monopolies ever since, the organiser of the monopoly reaps the fat profits, not the producer. Of course, the days are long gone when this sort of behaviour was condoned (although as recently as World War II there were shocking atrocities in these islands). Forced removal of inhabitants and replacement by imported slaves is no longer standard business practice. But businesses still crave after monopoly and constraints on competition. The favoured businesses are those with a natural monopoly or one created by government regulation. Today 'network externalities' (being the dominant player in an industry where technology gives a huge advantage) and having 'first mover advantage' are the keys to business success in many industries, notably information technology. These companies are so highly valued in equity markets because investors believe the future will allow continuing dominance of their sectors. Perhaps the history of the Dutch East India Company might give us hope that such monopolies don't last forever. By the end of the 18th century the company was bankrupt and its charter expired. Good managers are replaced by time-servers; far-distant staff become indolent; markets change; governments come and go; rivals disrupt; and wars intervene. If all this seems too random, the modern answer is government-enforced competition regulation. At the same time, modern trade treaties contain elements of monopoly. Even the now-ubiquitous free-trade agreements are sub-optimal because they are a restraint on trade with parties excluded from the deal. Plurilateral treaties, such as the unachieved Trans-Pacific Partnership, lay down behind-the-border rules that benefit one party at the expense of others – on IT, environment and labour requirements. Well-entrenched supply chains often hold out competitors with exclusive deals with their component suppliers. Of course, this is a long way from the brutal restraints on competition practised in 17th century globalisation. And Indonesia's spice islands might ruefully contemplate how, when they finally got rid of the Dutch monopoly, free trade took away the source of riches before the traditional owners of the spice islands could work out their own form of beneficial monopoly on exclusive products, with regionally-branded nutmeg and cloves. Instead, the colonisers (especially the British) took plants and spice-growing to other parts of their own empires. 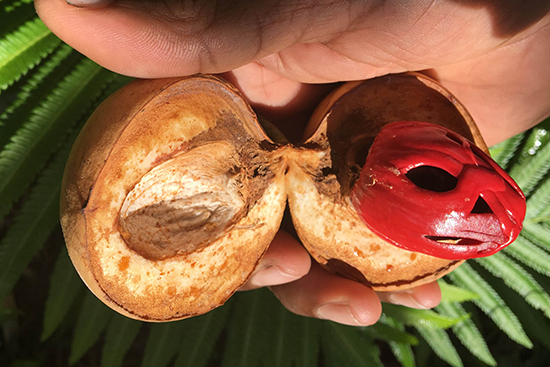 Nutmeg-growing so dominates the Caribbean island of Grenada that the nation has put the nutmeg fruit on its national flag. Meanwhile the fabled Indonesian spice islands have remained mired in genteel poverty.